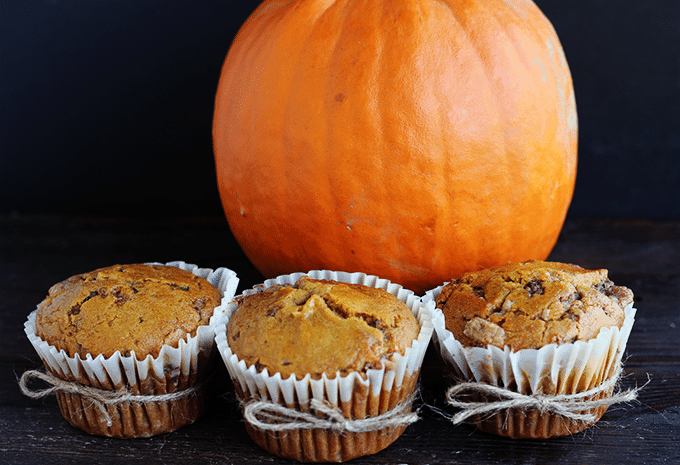 In the spirit of fall and the upcoming holiday, Thanksgiving, I made these delicious muffins. 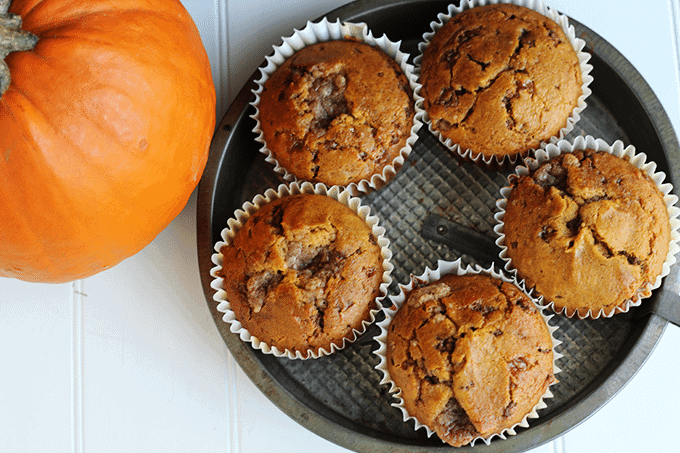 I had made a streusel for the top of these delicious toffee bit filled pumpkin muffin, but he wasn’t playing nice with me. It wanted to spread all over even though it was frozen, so I stuffed it inside the muffin for a sweet little surprise. I think it worked out well for me. I’m not a huge muffin fan, but these were pretty fantastic. As you can see on some of these muffins, that delicious streusel is peaking out of the top. I really wish I had one of these beside me right now with a nice hot cup of coffee. Unfortunately, they didn’t stick around. Lately, I feel like I’ve been neglecting everything from my blog to sleeping and housework. We’re having difficulties with the baby sleeping in his room. I know, he’s not a baby anymore since he’s two and a half years old. Anyhow.. he wakes up crying for me in the night. We went and got a dim 15 watt light for his little lamp in his room since we thought maybe he’s afraid of the dark. We also turned his crib into a toddler bed. Last night he ended up falling out of bed, but until 3 whatever in the morning we were all finally sleeping soundly. This has been three plus weeks of sleepless nights and whiny days. 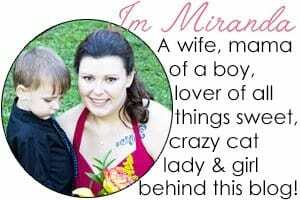 I’m definitely going to have to push myself getting back into the groove of blogging. I love it so much, I don’t know why it’s been a struggle. OH.. that’s right. Exhaustion. I used a large wilton muffin pan for these. Here’s an amazon link to the pan. In a small bowl, Add in brown sugar and cinnamon. Stir until the cinnamon is thoroughly mixed into the sugar. Add in the flour and stir. Cube the butter and place into the bowl. Using a fork, cut the butter into the flour/sugar mixture until there are no more large chunks. It will start to look like wet sand. Place in the freezer for about 30 minutes to an hour. Preheat oven to 375. Line a large muffin pan with liners. In a large bowl, add the sugars, cinnamon, and pumpkin pie spice. Whisk until the spices are incorporated. Add in the pumpkin and oil. Whisk together. Add in the eggs, vanilla, and milk. Give it a whisk until everything is combined. In a separate bowl, sift together cake flour, baking soda, baking powder, and salt. Add the dry ingredients into the wet ingredients and whisk until combined. Add in toffee bits and walnuts. Stir. Pour into the muffin liners until two-thirds full. Place a few chunks of the streusel on the top of the muffins and push them down into the center. Place into the oven at 375 for 15 minutes and then reduce the heat to 350 for 10 minutes. 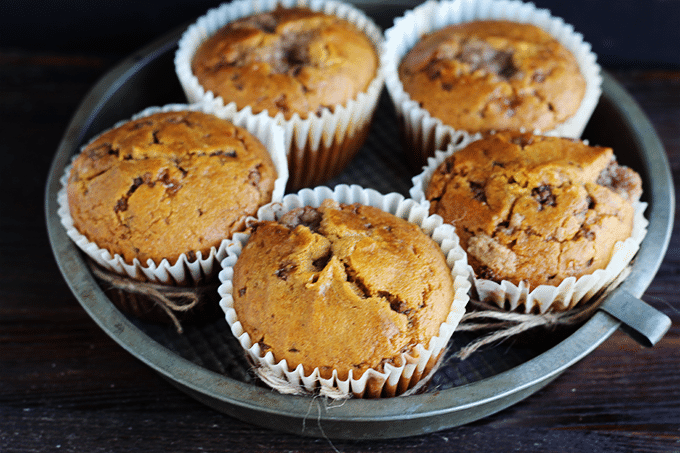 Check to see if the muffins are done by placing a tooth pick close to the center. If it comes out clean, they're done! 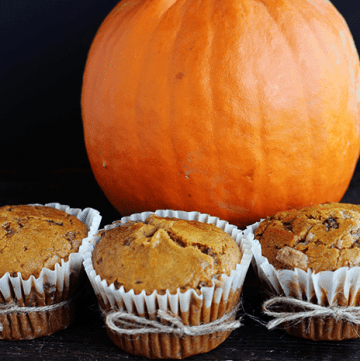 Enjoy the streusel stuffed pumpkin toffee muffins! Oh my god! These look so good! 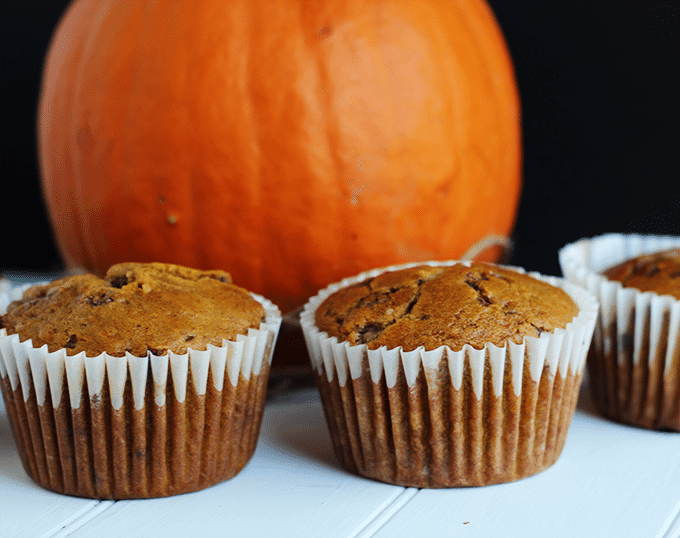 I’ve been craving one last taste of pumpkin before Thanksgiving is over. I’m going to make these this weekend. You’ll have to let me know how they come out for you! My pumpkin cravings continue into Christmas. I just can’t help myself.